Russula gracilis is a small russula with a mottled cap, found in low, wet ecosystems (usually near birches or willows) across North America. It has a sharply acrid taste, and a creamy to yellow spore print. The cap colors are variable, but involve shades of pink to red, and shades of green. The stem is white, but often features a flush of pink. 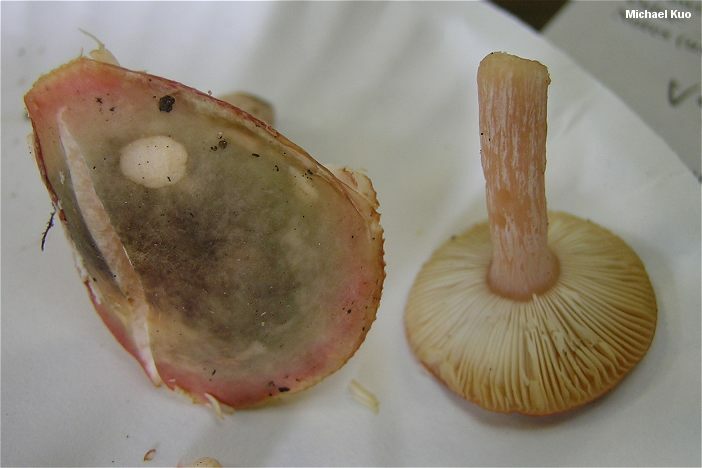 California authors (Arora, 1986; Thiers, 1997b) report Russula gracilis under Douglas-fir; they may be describing a separate species with similar morphology. Ecology: Mycorrhizal with willows, alders, and birches (the illustrated collection was made under water birch) in riparian ecosystems; growing alone, scattered, or gregariously; summer and fall. Cap: 3-6 cm; convex, becoming broadly convex to flat; sticky; smooth; mottled with shades of red to pink and green to olive--usually with the greens over the center and the pinks nearer the margin; the margin sometimes becoming slightly lined at maturity; the skin peeling fairly easily, usually at least halfway to the center. Gills: Attached to the stem; close; white to creamy or very pale yellow. Stem: 3-5 cm long; up to 2 cm thick; fragile; whitish, often with pink flushes. Flesh: Whitish; unchanging on exposure. Odor and Taste: Odor not distinctive; taste acrid. Spore Print: Creamy to yellow. Chemical Reactions: Iron salts negative to pinkish on stem surface. 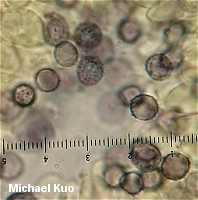 Microscopic Features: Spores 7.5-9 x 6-7 µ; with low warts projecting to about .5 µ; connecting lines scattered, usually not forming reticulated areas. 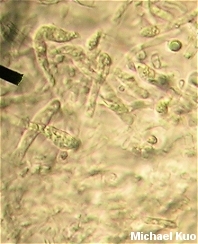 Pileipellis a cutis embedded in a gelatinous matrix; pileocystidia cylindric to clavate; ochraceous-refractive in KOH and positive in sulphovanillin. REFERENCES: Burlingham, 1915. (Burlingham, 1915; Saccardo, 1925; Arora, 1986; Kibby & Fatto, 1990; Phillips, 1991/2005; Thiers, 1997b.) Herb. DBG: RMNP 2009-004.